I am sorry to report that Richard is currently unwell. He has been in hospital Intensive Care for 8 days with pneumonia as a primary medical problem. This has responded to treatment and he has shown some improvement and is now free of the breathing apparatus. That news was posted just 13 days after he played Knitting Factory (see above), and just 15 days before his scheduled show with Television this Saturday in Central Park. Now people are wondering if he’ll be well enough to play. According to a Summerstage spokesman, Richard will be playing with Television “as far as we know”. That’s all I’ve got. 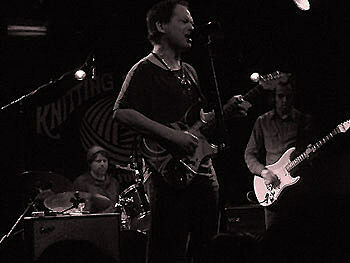 After the possible Summer stage show in New York City on June 16, which is to be announced by the city of New York on May 15, Richard Lloyd will, after 34 years, be amicably severing all ties with the band Television, in order that he may concentrate his magnetic force and supernatural energies upon his own career in support of his forthcoming record, due out in the fall. This new record directly competes with Marquee Moon, Axis: Bold as Love, The Doors, Patti Smith’s Horses, Bob Marley’s Natty Dread, Neil Young’s Harvest, or any other record you can name, as one of the greatest records ever made in the history of rock ‘n roll. That being so, Richard needs to concentrate all of his energies to support it and its subsidiary philosophies. To the fans of Television, from the very first show at the townhouse Theatre on March 4, 1974 till the hopeful last show here in New York at the Summer stage — which by the way, is a free show, thank you for your support over these many years. I hope to see you follow both my own and the other members of the band in their own solo efforts for many more years to come. Richard, feel better, and I hope to see you up there on stage this Saturday.